A biohazard suit -- or hazmat suit -- is a protective sheath, an impenetrable outfit that prevents contamination. These suits often possess self-contained breathing units, in case of the event of airborne infection. 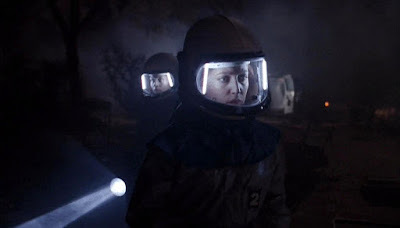 Biohazard suits go way back in the culture, and can be seen on TV in the 1960s, in The Outer Limits (1963-1964) and on Star Trek (1966-1969) to name just two examples. In Star Trek, Spock wore such a suit while exploring the frozen outpost on Psi 2000, in "The Naked Time." But the hazmat suit really entered the public consciousness in the mid-1990s, during the heyday of Chris Carter's The X-Files, and after the release of Outbreak (1995). Both the series and the film dealt in the post-Hot Zone milieu. Today, the hazmat suit is a de rigueur element of many series, especially those that contend with plagues or epidemics. Agent Scully (Gillian Anderson) memorably donned a biohazard suit in the second season The X-Files (1993-2002) story, "F. Emasculata," which concerned a new, Ebola-like virus (intentionally) released by a Big Pharma company into an unsuspecting prison population in Virginia. 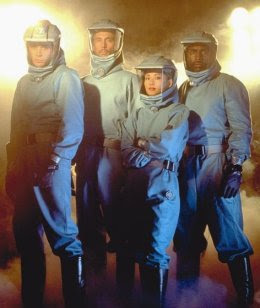 In the age of X-Files knock-offs, no series utilized hazmat suits more frequently than did The Burning Zone (1996-1997), a series about doctors battling outbreaks (some sentient...) each and every week for its single season on the air. More recently, the biohazard suit was seen during the episodes of The Walking Dead (2010 - ) set at the CDC laboratories. 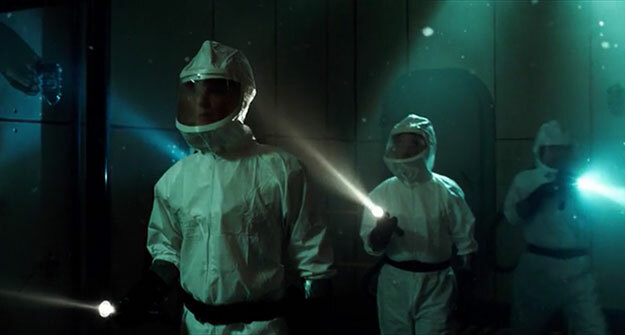 Both The Strain (2015 - ) and last summer's eighties flashback hit, Stranger Things (2016) extensively feature bio-hazard suits, both for dealing with viruses, and contending with toxic environments. These hazmat suits are the uniform of a future in which man wages war against not Martians, but microbes.